Tony Stark is back. This time there’s more Iron Man. More SHIELD. But the same old Tony. His main Nemesis this time around is Ivan Vanko. A secondary nemesis in a sense of the word, is the U.S. Government. They, along with Tony’s friend Lt. Col. James Rhodes, and industrialist Justin Hammer, want the Iron Man technology for weapons. Tony wants it used for defense, not offense. The book is full of action sequences. From the moment Ivan Vanko first shows up, it seems nonstop action until the end. I can’t go into much more detail, except to say it was a very enjoyable book. There was some language/situations in the book that might not be wholly appropriate for those under 17. And of course there are some scenes of action violence, explosions, fights, etc. 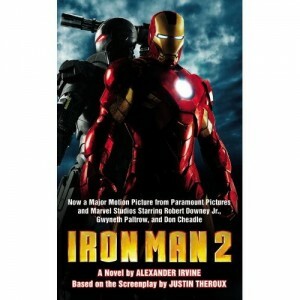 But for fans of Iron Man, Marvel, or just comics in general, I’d recommend this book. As of this writing, I haven’t seen the movie, but if the book is any indication, it should be quite a summer movie. *Disclaimer* A special thanks goes out to Anna at Hachette Book Groups for a review copy of this book. It in no way influenced my review.